Featuring a terrace, Real de Cartuja Apartments & Suites offers apartments in Granada. It is located next to Granada’s Triunfo Gardens and 300 m from the Albayzín district. Plaza Nueva is 500m away. These apartments are not right in the absolute centre but the barrio has a pleasant studenty feel with lots of outside terazas. 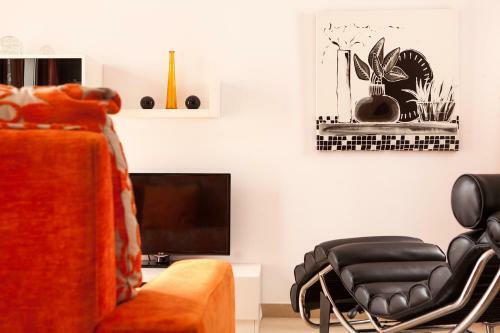 All apartments and suites at Real de Cartuja include a seating area with sofa and TV with satellite channels. The kitchen is equipped with a stove and microwave. The bathroom comes with a bath or shower. Free Wi-Fi is available throughout. The Cathedral and the Mirador de San Nicolás Viewpoint are a 15-minute walk away. Granada Train Station is a 10-minute walk away. Federico Garcia Lorca Airport is 17 km away. This hotel is 1892 metres from the Alhambra entrance, 1026 metres from Plaza Nueva (the absolute centre of Granada), 952 metres from the train station and 1995 metres from the bus station.